Pashin began his 32-year music-teaching career in 1971 in the Matawan-Aberdeen (New Jersey) School District. “My first 28 years I worked exclusively in the elementary grades, where I taught band instruments and was responsible for presenting shows at holiday times and in the spring. 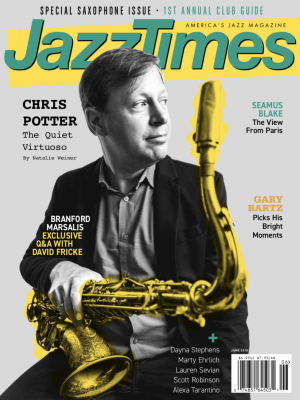 A trip to New Orleans, the birthplace of jazz, in late February 2013 changed Jerry’s life. He and his wife, Susan, and son, Dan, are planning to return soon to “get a more intimate feel for the city and its culture … My trip to NOLA was a spiritual and artistic trip to Mecca. It was a six-day trip that was life-changing. We arrived there on a rainy Monday night in late February. We checked into the hotel about 7 p.m. and by 8 p.m. we were at Café Maison, a club on Frenchmen Street. I was there to play in an invitation-only jam. When I arrived, I introduced myself to Gene, the jam master of the night. He said, ‘You must be The Legend from Jersey.’ I was called up after the local cats got up. I stayed on stage for the next three-and-a-half hours! What an experience! “The next day we went to Congo Square and Louis Armstrong Park. I could swear I felt ghosts all around me. 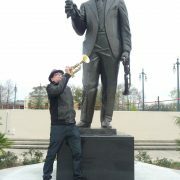 I played at the base of the Satchmo statue. It was very moving.” A visit to the Buddy Bolden Memorial at Holt Cemetery also moved Pashin. “I played, but it was difficult. I felt as if I were at the village of my ancestors. I felt Buddy’s presence. From where did the nickname “Legend” spring? Turns out that someone with the nickname “The Boss” is involved. “I went to a benefit show at the now defunct Tradewinds, a club on the Jersey Shore. Word had it that Bruce Springsteen would be making an appearance. Soon after I arrived, Danny White, who was performing that night, came up to me and confided in me that the Boss would be there. Five hours later, Bruce made his way to the stage. It was definitely worth the wait. After the show Danny said, ‘Follow me,’ and led me to a dimly lit back bar. There he was, Bruce Springsteen. I was introduced and I must say that Bruce was gracious and humble. He thanked me for coming to the show.